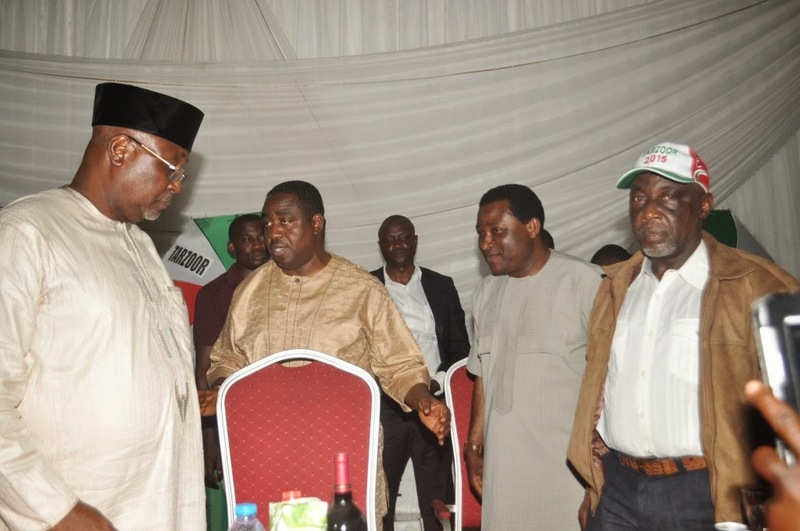 On Friday the 23rd of January 2015, members of the PDP in Benue gathered at Royal Choice Hotel, for a fund raising dinner for the gubernatorial elections next month. Governor Gabriel Suswam was the chief fund raiser and he urged donations of all sizes. The occasion was chaired by Senate President, of Nigeria represented by Honourable Minister for Internal Affairs Comrade Abba Moro, the Chairlady was Hon Christine Alaghga. Both Chairpersons spoke after the Director General of the Tarzoor / Ngbede Campaign Organisation Sen. Amb. Prof. Iorwuese Hagher. They all urged invited guests and donors to offer their support to the actualisation of our common goal, which is to ensure Hon Tarzoor and Hon Ngbede become the Governor and Deputy of the state respectively. Hon Abba Moro and friends from the ministry of internal affairs donated N30 million while friends from outside the ministry donated N50 million. Benue sons in the diaspora Dr Akaahan Dominic, Dr Timothy Ijir and an anonymous donor donated N10 million each. The current Benue House of Assembly members donated N5 million. Paul Orhii, DG of NAFDAC, Hon. Blessing Ene, PDP House of Representative members, and the state executive committee donated N2 million, Hon. George Oko led MSG Old Boys Association set of 91 to donate N400,000 to the campaign as well as an anonymous donation of 10,000 Euros and two Prado SUVs. Numerous other donations poured in. Hon Tarzoor and his running mate expressed joy and humility at the amount of support the party and other individuals showed them.The dinner came to a conclusion following a witty remark by one of the MCs, Stevie Ayua who stated that if more time was spent, the dignitaries will be served breakfast. Governor Suswam gave the final speech and closed the event.